When we think of air quality we tend to think about the atmosphere outside of our home. Air pollution, dust and pollens are all airborne material that can affect our breathing and our health. 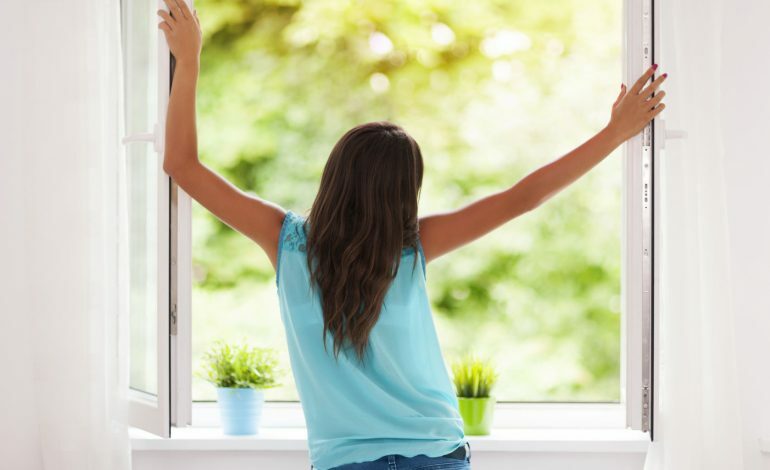 This is the easiest and simplest way to improve air quality in your home. All you have to do is open the windows. Fresh air coming in flushes out all the air filled with toxins. If you live in a large urban area where smog is an issue, opening the windows may not be in your best interest. The alternative to this is to use an air purifier/air conditioner that will pull air into the system, filter it by removing airborne particles and releasing clean air into your living space. When vacuuming, use one that has a removable HEPA filter built into it. This way you can filter the air by trapping some of the offensive dust or mites. By removing and cleaning the filter regularly you dispose of them. The nifty thing about air filters is that they do a great job of trapping those microscopic spores and dust particles that we can’t see but irritate our eyes or get lodged deep in our lungs through normal breathing. Additionally, get help from Simplymaid – cleaner to clean your house professionally. You can run tests of the air quality in your home. Consumer brand CO (carbon monoxide) detectors are commonly found in hardware stores. Testing also for radon and lead are good ideas. Each of these can be removed from your home as they can develop into health issues. Older homes in particular may be common offenders of releasing these gases. The logical place to first test is in a basement or crawlspace. To see what levels you are living in during the day, test the main floor but be sure to hang the testing gear at a level close to where you breathe the air in your home. When you clean your home, be sure you are using environmentally safe products. This means they will be a green alternative with no harmful chemicals or toxins. The reason why you would want to switch these out is that the chemicals in some cleaners can result in skin irritations and develop into rashes, as well as trigger allergic reactions in those who are sensitive. There are many cleaning products on the market these days for people that are sensitive to the chemicals in cleaning products. Because they are not as harsh as the regular products, they may not work quite as well, but are still worth it since they won’t wreak havoc on the environment or your health. When you use a fragrance product or air freshener to freshen up a room or area in your home, you may want to think twice. Many fragrance products are created by using a mixture of chemicals that produce the finished scent. Sensitive eyes, ears, nose, throat and skin can all be targets of the chemicals that are used in many different fragrance products. Fortunately there are many non-toxic and hypoallergenic brands available in the marketplace to address this concern. So if you like to use fragrances around the home, and are likely to suffer irritations, then make sure to seek out an air freshener brand that is formulated specifically for those who suffer from asthma or other sensitivities.